← Chubby’s Tacos is Coming to Falls River Towncenter! I took this picture Sunday afternoon in front of the NC Museum of Natural Science. 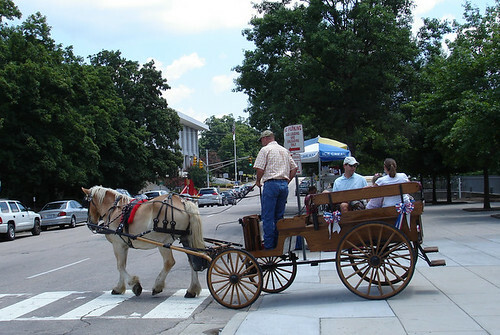 I’m not sure how much they charge, but you can take a short carriage ride around downtown. They also had a miature pony out in front of the Museum. I sure hope they don’t expect that little guy to cart people around too! Carrie – I’ve seen the horses there before. Not sure if they are there every weekend, but they do seem to be around on a pretty regular basis. I think I saw the little pony you mentioned. He was tiny. I think his name was “Marbles”. Poor little fella. I hope they don’t work him too hard!! Thanks forth comment. Hope you enjoyed your trip to Rocky Mount!! !